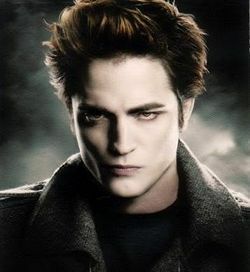 Robert Pattinson - Edward Cullen. Robert Pattinson-Edward Cullen. Wallpaper and background images in the crepúsculo la película club tagged: twilight movie edward cullen robert pattinson. This crepúsculo la película photo might contain capucha, campana, prendas de vestir exteriores, overclothes, prendas de abrigo, ropa de abrigo, manchó, abrigo de la caja, and caja de capa. he is soooooo cute and i love his character on twilight.it is so creative and intense.i luv twilight.it makes me want to be a vampire.